Courses at NMC are offered in one of three formats: face-to-face, online, and hybrid. Face-to-face courses meet in a classroom at regular, prearranged intervals. 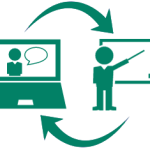 Instructors may use online resources to supplement face-to-face instruction. Online courses meet entirely online. Students are responsible for logging into Moodle in order to complete assignments and activities. Online courses offer greater schedule flexibility, but instructors still assign due dates. Online courses may also have proctored testing requirements that require students to complete tests on campus, at a local proctored test location, or online throughout the semester. Hybrid courses blend online and face-to-face delivery. Substantial portions of the coursework is delivered online (30 – 79%), typically using tools in Moodle, like discussion forums, assignment drop boxes, or reading assignments. Hybrid courses also meet face-to-face on a reduced schedule. None of the three options is easier or less time-consuming than the others, but some students may find a particular delivery method a better “fit” for their learning style. computer-savvy and comfortable working with email, uploading, saving and downloading files, Microsoft Office or Google Docs, and basic internet search functions. comfortable reading, writing, and communicating online. benefit from engaging with instructors and classmates in person. do not have reliable internet access or are not comfortable navigating online. prefer to have immediate feedback and guidance from instructors. can commit to attending class regularly. Ready for Online Courses? (Michigan Colleges Online). Online Learning Readiness Questionnaire (University of North Carolina). Skills for Online learning – Assessment of Readiness (Mt. San Antonio College).